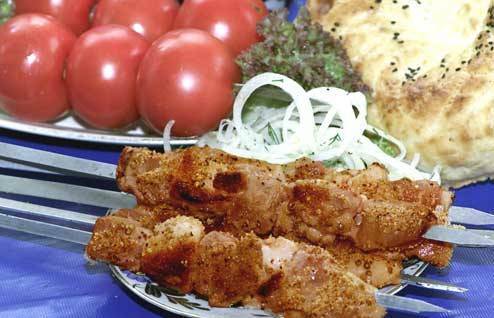 A wide usage of meat is peculiar to the Uzbek national cuisine. Traditionally the Uzbeks prefer mutton, they eat beef very seldom, and more rarely they use horse meat for cooking some kinds of meal (bologna and etc.). The characteristic feature of modern Uzbek national cuisine is the usage of different vegetables such as carrot, pumpkin, potatoes, tomatoes, turnip and others. Although potato, cabbage, tomato, aubergine have begun to cultivate in Uzbekistan since the end of the XIX century, today these vegetables are grown and used all over Uzbekistan. Different herbs both cultivated and wild found wide application in the Uzbek cuisine. Such seasonings as coriander, mint, basil, red pepper and others are added to the meal in rather big doses. Flour and grain make the base of the greater part of Uzbek dishes. The majority of different and difficulty cooked flour dishes indicate on deep traditions of this original cuisine. Among flour products, noodles, which are used for cooking first and second courses, got a wide spread occurrence. Noodles are cooked like a soup (keskan-osh, suyuk-osh) with the dressing of sour milk and well melted oil; dried dill is added to the soup. Two similar dishes - narin and lagman – are the variants of thrown away noodles with seasoning. For the first of them noodles are cut from thin rolled out dough pieces which have been boiled in water or meat bouillon, then the noodles are added with boiled meat and filled up with a beef tea. it is significant that narin considered as a dish for important people. For example, in Tashkent it was served usually in those cases when only men gathered. Lagman - long noodles boiled in water. It is filled with gravy with a great deal of vegetables. Different kinds of pelmenis are very popular. Small pelmenis with cut meat and onion (chuchvara) are boiled in water, and big – manti – are cooked under steam in special grids – kaskans. 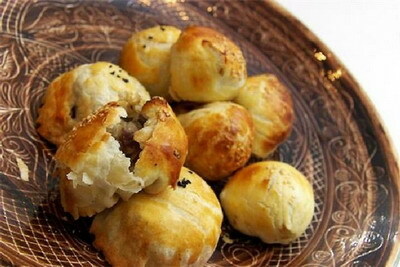 Different patties (somsa) are peculiar to the Uzbek cuisine. They are often cooked from meat, which is cut into small pieces, mixed with a great deal of onion and strongly peppered. Patties with pumpkin and well peppered are spread. Palov is a pride of Uzbek national cuisine. It is cooked in all dining rooms and restaurants. Men often cook this favourite meal among the Uzbeks. Palov is cooked from rice, and somewhere it is cooked from rice and mung bean with meat, onion and yellow carrot (for example, in Bukhara). Much fat – vegetable or animal oil (fat of sheep) is added to palov. Black and green tea is a favorite drink in Uzbekistan. It is drunk everywhere. Green tea, or so called “kok tea”, taken usually without sweets, quench one's thirst well in summer heat. One should note, that the Uzbeks kept an immensely respectful attitude to bread. Children from early years are learned to pick up every crumb, fallen on the ground, in order “bread was not defiled”. Bread is kept in the anteroom, honorable part. 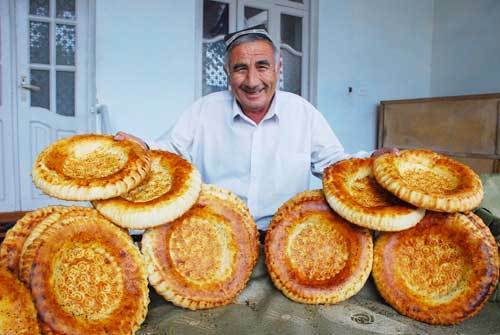 Only elders in the family have a right to break bread (flat bread "lepyoshka" is not cut). An ability to serve meal on the dastarkhan enjoyably and gracefully is appreciated among the Uzbeks. Modern cultural skills and traditional national etiquette harmonize with new customs. So, meal is served on plates for everyone individually.